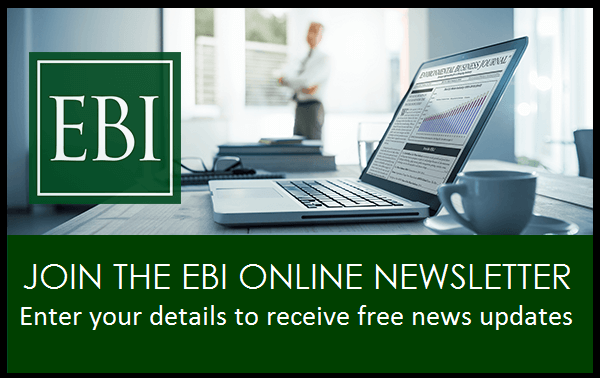 President and CEO, Environmental Business International Inc.
Grant Ferrier founded Environmental Business Journal in 1988, and it soon became recognized as the environmental industry’s leading source of strategic market information. The business evolved into the research, publishing and consulting company now known as Environmental Business International, Inc. Grant has worked extensively for government and private clients and co-authored the U.S. government’s definitive assessment of the U.S. environmental industry, published by the U.S. Dept. of Commerce’s Office of Technology Policy. He has represented the interests of the Environmental Industry in government and business forums, testifying before Congressional Subcommittees and serving on advisory committees for the OECD, the U.S. EPA and the U.S. Dept. of Commerce. He has offered expert opinion at international meetings sponsored by the United Nations Department of Policy Coordination and Sustainable Development (DPCSD) and the United Nations Conference on Trade and Development (UNCTAD). In 1996 EBI founded Nutrition Business Journal, since sold. 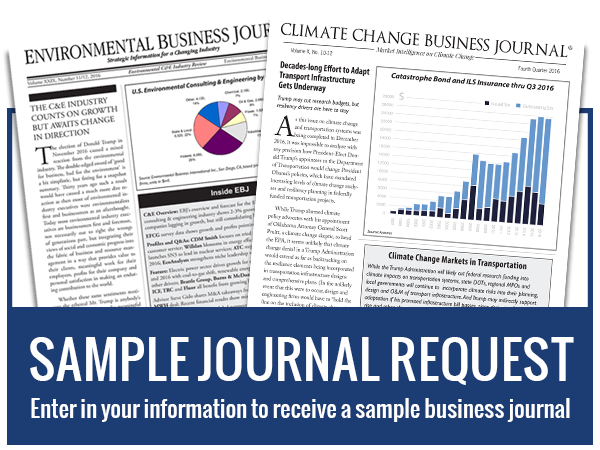 In late 2007 he launched Climate Change Business Journal®, after having spent several years conceptualizing an economic framework and definition for the Climate Change Industry. Before entering the publishing business, Grant worked in the private sector in energy efficiency, solar energy and wind energy from 1978-1984. He has degrees in Mechanical Engineering and Conservation & Resource Studies from the University of California, Berkeley. George has more than 25 years of experience in journalism, working primarily for the environmental and electronics industries. Prior to joining EBI, George served for more than a decade as editor of Golob’s Environmental Business Report (formerly Hazardous Materials Intelligence Report). He served as managing editor of the Massachusetts Environmental Ventures newsletter, produced in cooperation with the University of Massachusetts-Boston’s Environmental Business and Technology Center. He also produced environmental newsletters for companies including Zurich American and PricewaterhouseCoopers. George has a B.A. degree in Philosophy from Lawrence University and an M.A. in Philosophy from Washington University. Jim is a researcher, writer, editor and project manager with more than 35 years experience serving public, non-governmental and private-sector organizations. He has worked with EBI since 1999 and edited Climate Change Business Journal since its launch in 2007. Past and current clients include: Arysta LifeScience, Asia-Pacific Economic Cooperation, The Buckeye Conservancy, Canadian office of Foreign Affairs & International Trade, Center for Environmental Economic Development, Nestlé USA, Organisation for Economic Cooperation and Development and U.S. Agency for International Development. His journalism credits include Boston Globe, Boston Herald, Sacramento Bee, Technology Review and many others. Brian A. Runkel is a founding board member and Executive Director of the California Environmental Business Council, Inc. (CEBC). Brian served as Deputy Secretary of the California Environmental Protection Agency (Cal/EPA) from 1991-1993, where he helped create the new agency, while being responsible for regulatory coordination between the Agency’s boards and departments. He also established the California Environmental Technology Partnership, a private-public partnership to assist and promote the $30-billion California environmental industry. Prior to his tenure at Cal/EPA, he was Chief of Staff in the U.S. Environmental Protection Agency’s Office of Enforcement from December 1989 to March 1991. USEPA enforcement was at record levels during his tenure under Administrator William K. Reilly. In addition to managing CEBC, Brian runs his own environmental & energy management/consulting firm, Runkel Enterprises, that increasingly specializes in business strategy relating to climate change. Brian is a graduate of Harvard Law School and George Washington University. Energy Editor & Federal Markets Analyst, Environmental Business International Inc.
Andrew “Andy” Paterson, EBI’s man in the Nation’s Capitol, has more than 30 years’ experience working in the energy and environmental sectors. He is a Principal of EBI financial affililate Verdigris Capital, advising a variety of clients and agencies on public sector and project finance. Previously he served as a Director for Econergy, a clean energy and carbon offset developer, where he managed consulting engagements on a variety of projects for energy, environmental and power sector clients in North America and abroad. During the last 10 years he served as a financial advisor on structuring federal energy policy programs, and as the lead commercial market analyst for a number of energy sector studies with the Department of Energy. Andy has a BA from Stanford University in Human Biology and Environmental Policy and attended the Cornell Graduate School of Business. He speaks on energy trends and environmental topics to a number of trade associations regularly, and is a moderator for the CCS Alliance. He was recently appointed a visiting Senior Fellow at the Atlantic Council for their Energy & Environment Program. Managing Editor, Environmental Business International Inc.
Lynette Thwaites has worked in business publishing as an editor, researcher and writer for more than 20 years. She was a co-founder of Environmental Business International and serves as Managing Editor of all EBI publications. In 1996 she helped launch sister publication, Nutrition Business Journal. In 2008 she helped launch Climate Change Business Journal. Prior to joining EBI, Lynette worked on a variety of arts and business publications, including as an editor for Impact Assessment Inc. and a periodical funded by the California Arts Council. She has a First Class honors degree in Literature from the University of Warwick, England, and an MA in Art History from the Courtauld Institute, London University. Marketing Manager, Environmental Business International Inc.
Jenny Christopher is responsible for executing EBI Inc.’s marketing strategy, including email campaigns and website development. She managed the transition of EBI’s print publications to an e-commerce platform and oversees online and corporate journal subscriptions. For the last four years, Jenny has promoted and organized EBI’s annual Environmental Industry Summit, the leading executive retreat for senior executives in the environmental industry. Prior to joining EBI, Jenny worked for the City of San Diego-Environmental Services Department on initiatives related to waste reduction, recycling and composting. She serves as a contract Program Assistant for I Love A Clean San Diego. In 2011 she spent four months in Chile working for the Wenger Patagonian Expedition Race, an international eco-adventure race, coordinating international promotions and assisting with planning. Jenny has a Bachelor’s degree from San Diego State University in Business Administration & Marketing, with a special focus on Environmental Economics and Natural Resource Management. She also holds a Professional Certificate in Sustainable Resource Management from the California Resource Recovery Assn. Office Manager and Subscriber Services, Environmental Business International Inc.
Moe Wittenborn has been Office Manager for Environmental Business International since 1994. She manages subscriber services and fulfillment, document production, data entry, database management, and Burmese lunch preparation. Walter S. Howes is the Managing Director of Verdigris Capital, LLC, a private equity partnership focused on sustainable solutions in the areas of energy, transportation, agriculture, construction and information management. Prior to founding Verdigris, Walter served at the U.S. Department of Energy. As Director of the Office of Acquisition Reform and Privatization he was the principal advisor to the Secretary of Energy, developing and implementing the Department’s privatization, finance and acquisition reform initiatives. As the initial Director of the Loan Guarantee Office established by the Energy Policy Act of 2005, he formed a new entity now responsible for awarding and directing over $40 billion in Federal Loan Guarantees to drive the commercialization of sustainable, innovative energy and infrastructure projects. Walter has also worked extensively with the U.S. and foreign laboratory systems with a focus on commercialization of technologies in energy and other resource-intensive markets. In addition to government service, he has over 25 years of experience in global investment and commercial banking, private equity, venture capital and international privatization activities.